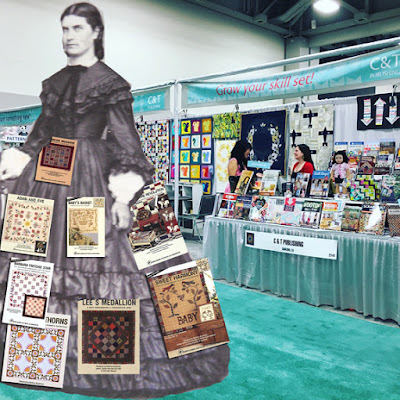 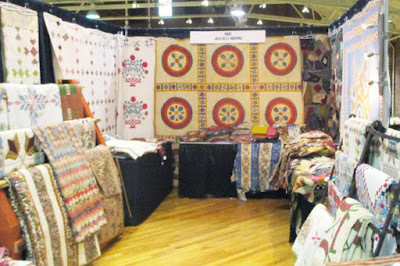 One good reason to attend the American Quilt Study Group Seminar, no matter where it is, is the Quilt Dealers Area. 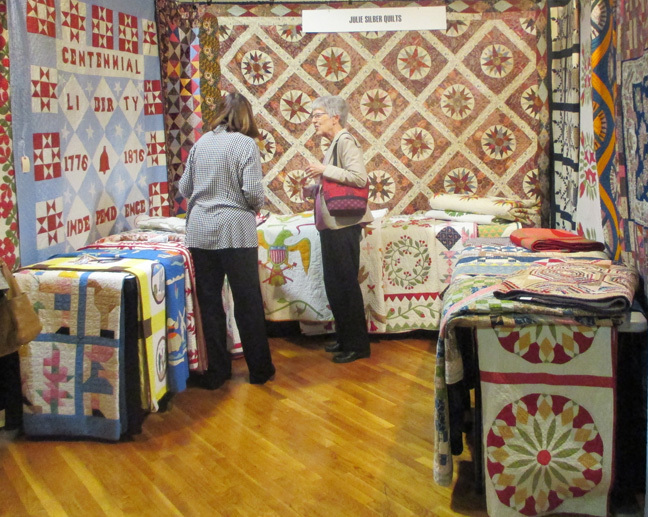 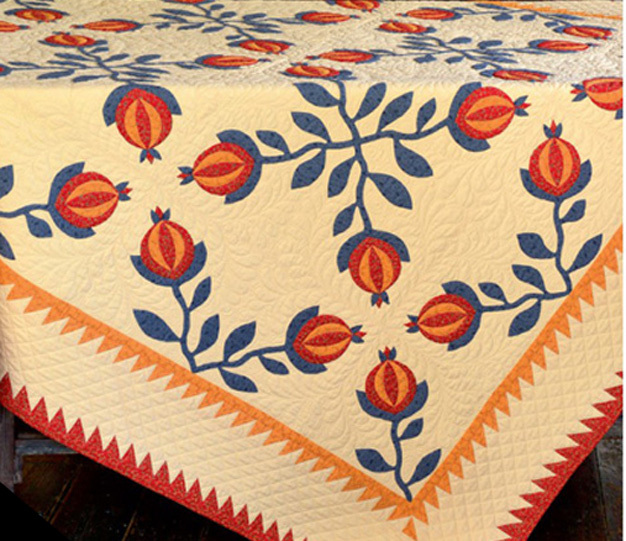 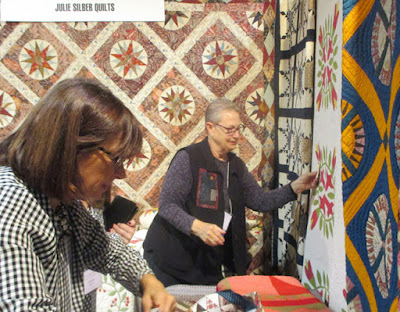 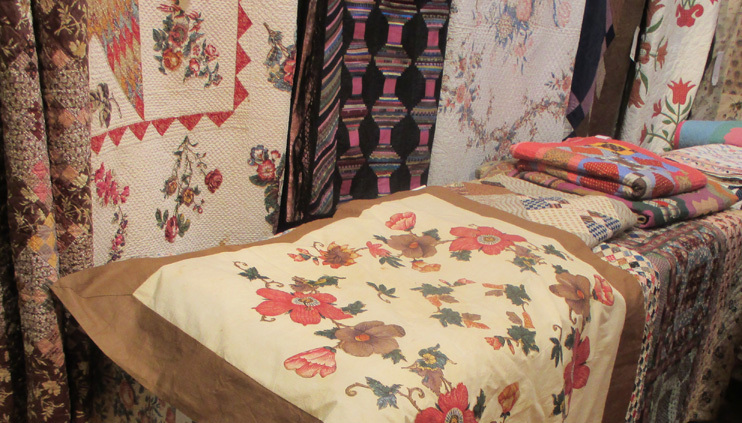 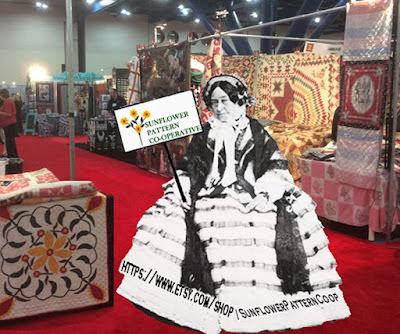 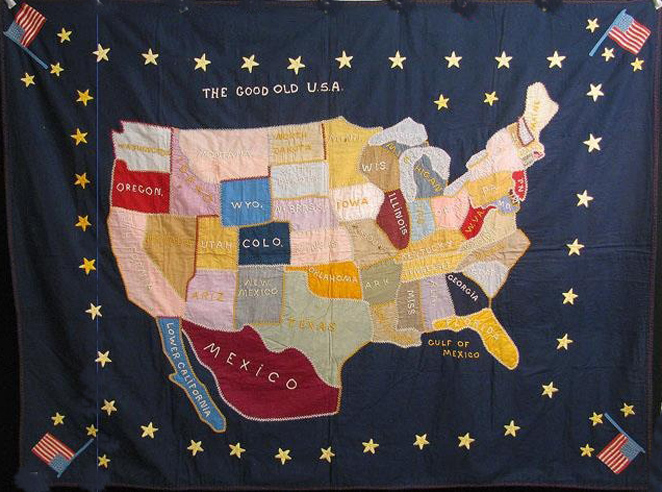 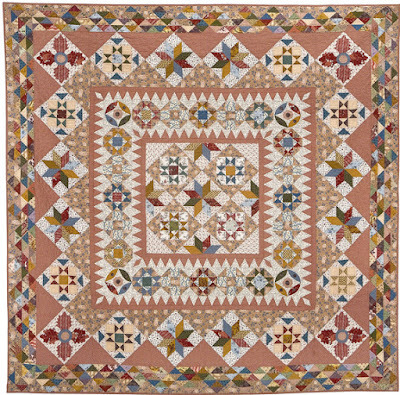 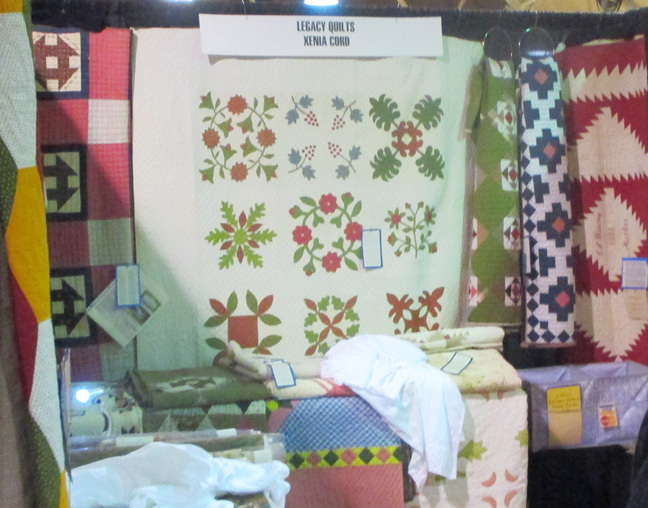 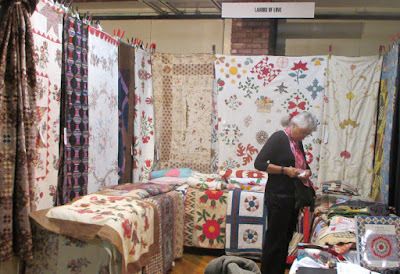 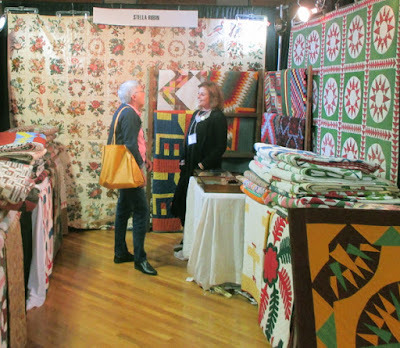 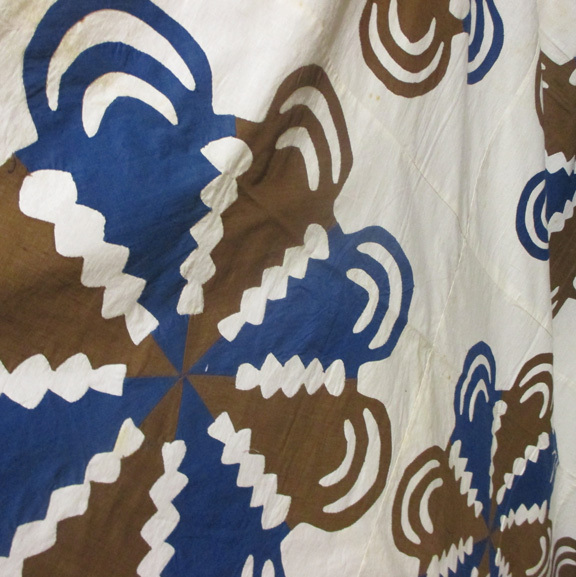 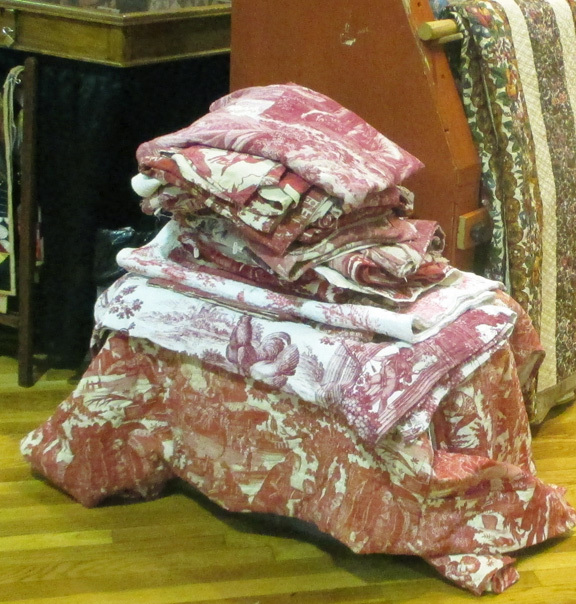 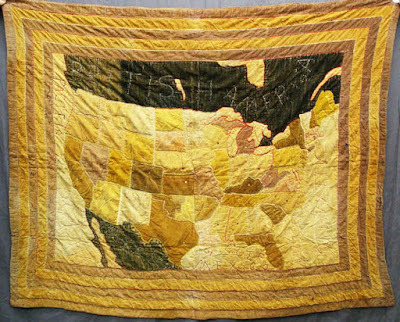 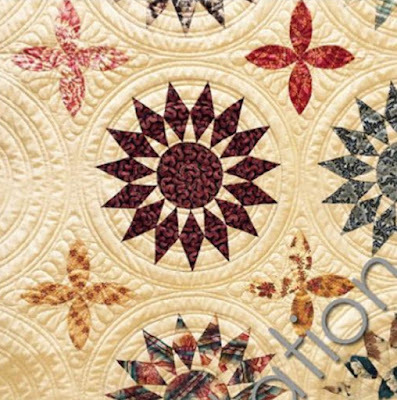 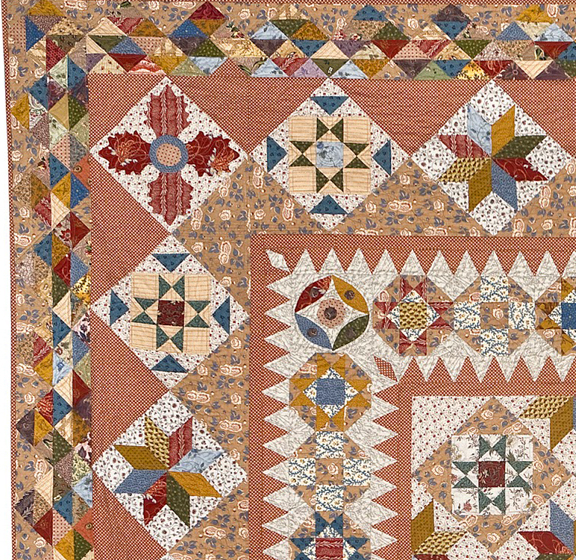 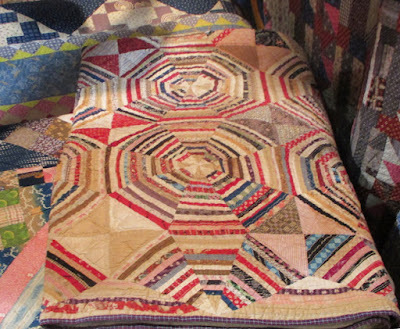 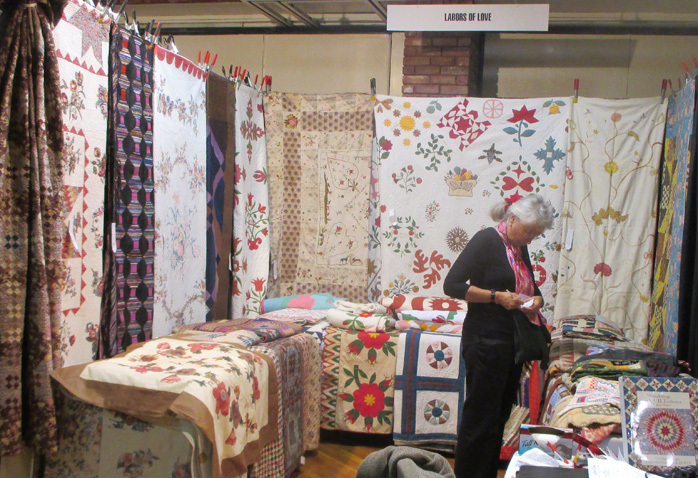 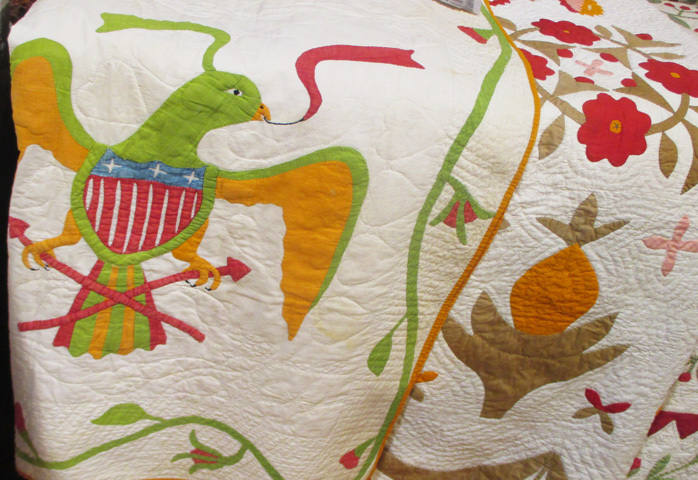 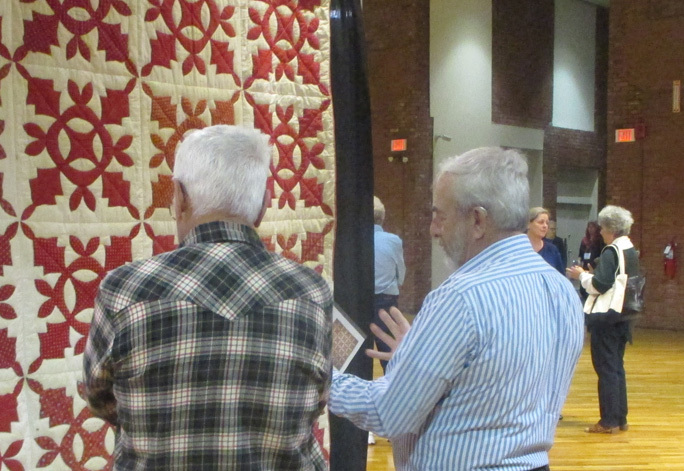 The best dealers in antique quilts from all over the U.S. show their stuff. 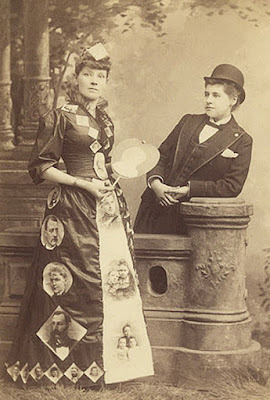 Kathy Metallica Cray and Julie Silber. 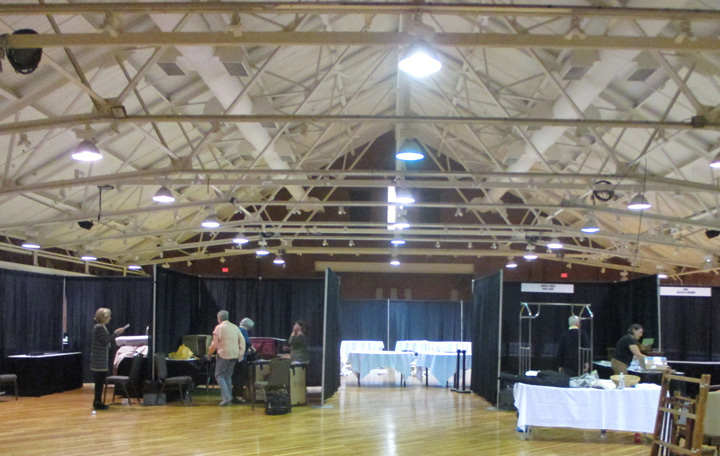 that went in the first half hour. 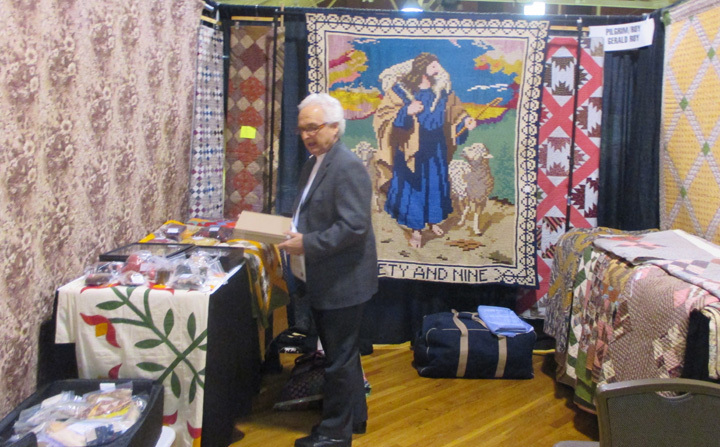 with the famous Ninety and Nine Quilt from the 1930s behind him. a unique Georgia quilt with tombstones among the circles. till I posted the photo. Nancy Hahn from Country Things brought her Portuguese stripe. 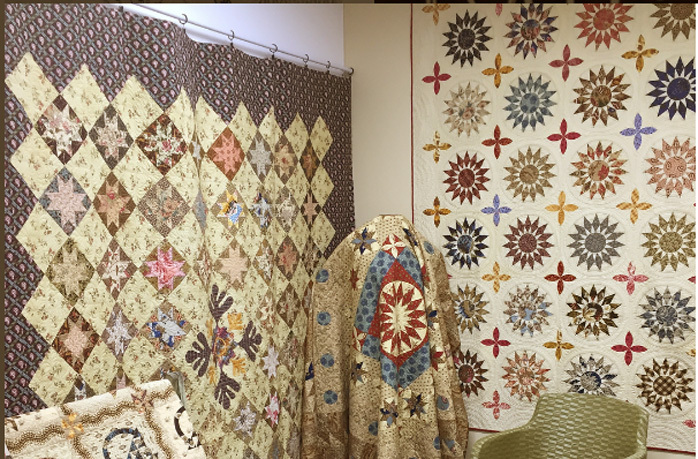 with a couple of Southern beauties below. 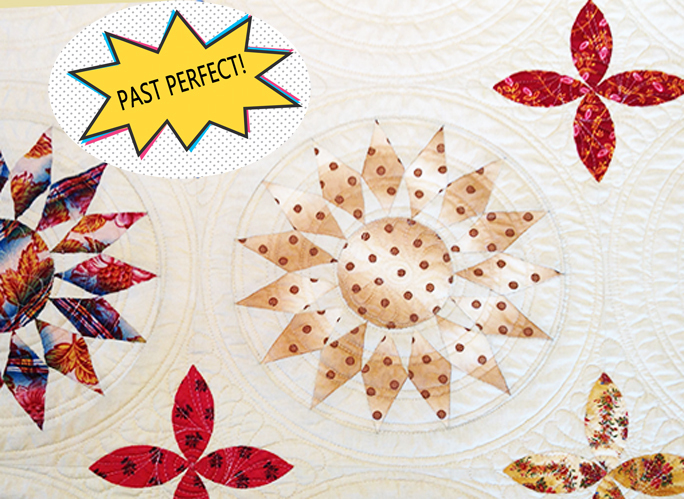 And then in a flash they were gone. 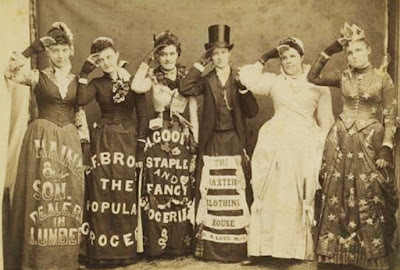 of women who were human advertisements. I encountered some problems with the Sunflower Pattern Co-Operative members agreeing to parade around like this. The word dignity came up. 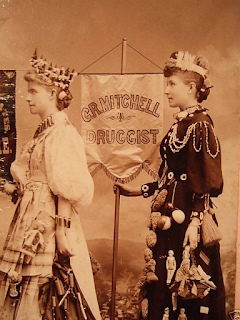 So I hired a couple of virtual signboards from the 1860s---nice wide skirts. So have fun at Market. I just got back from the American Quilt Study Group Seminar in Manchester and I will be napping. 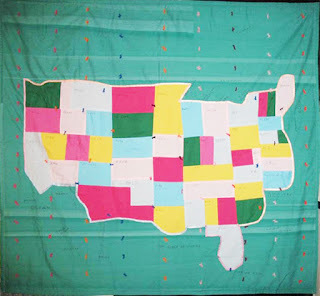 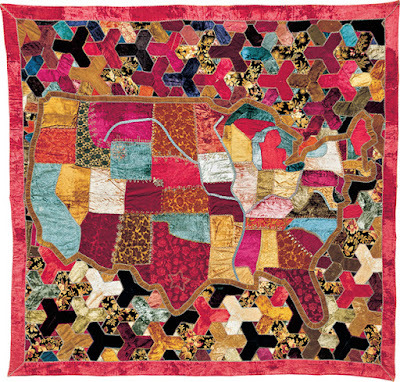 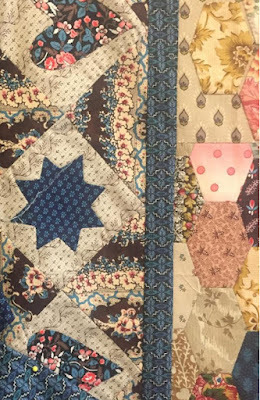 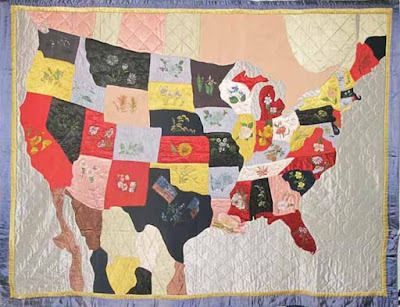 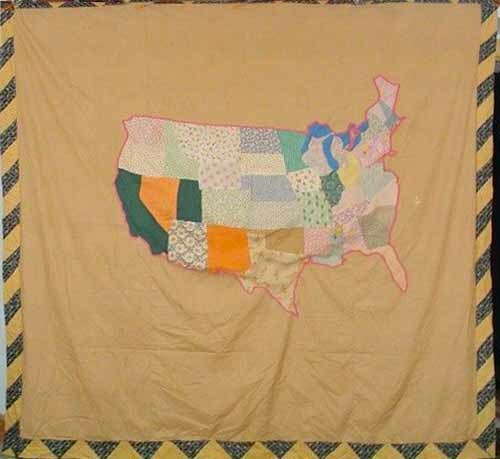 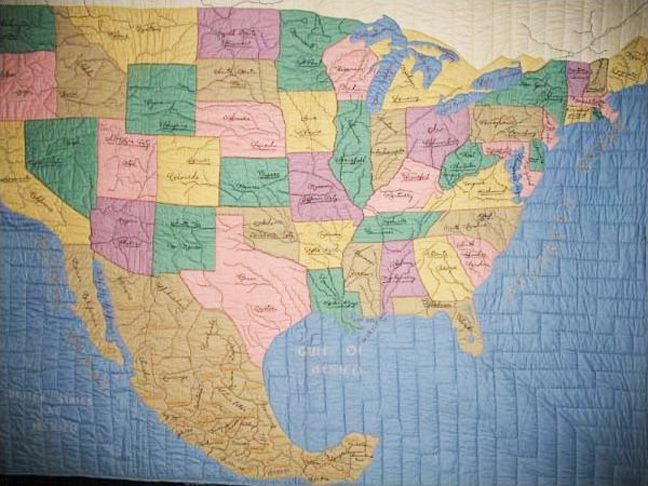 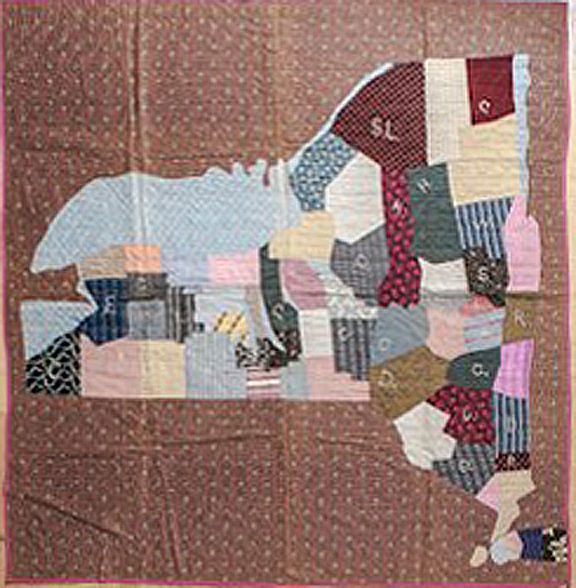 Did you ever notice how much a crazy quilt can resemble a map? 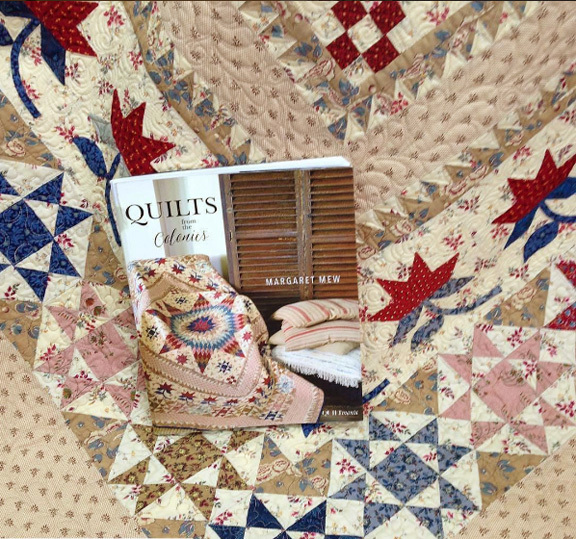 Wisconsin Quilts: Stories in the Stitches by Ellen Kort. "British America" it says above the Canadian border. 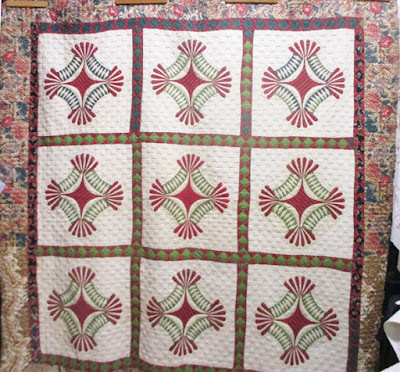 From Copake Auctions & Laura Fisher. 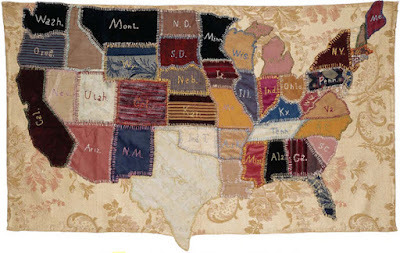 American Museum of Folk Art collection---with our major waterways. have this picture, probably from about 1940. I like the inaccurate representations better. going to do with Hawaii? 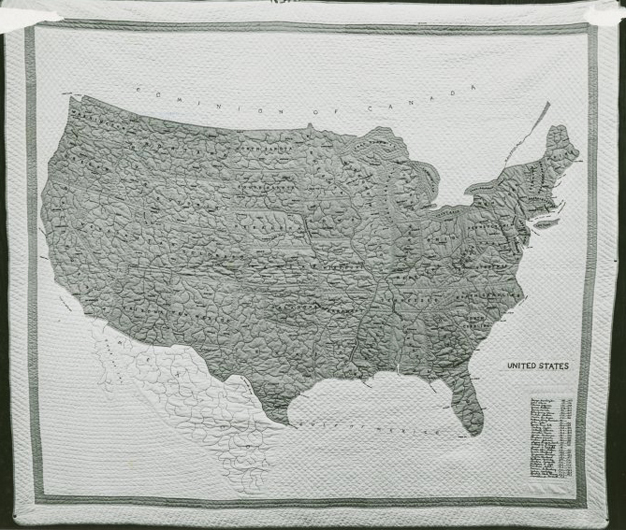 I've got several state maps in the file. 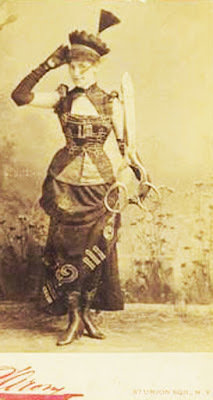 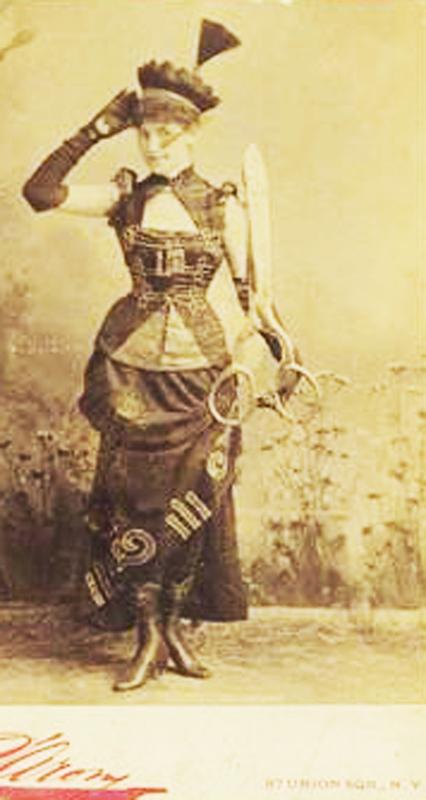 Harriett Deuell, Wyandotte County, Kansas, Dated 1887. 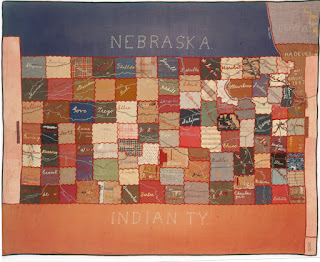 This is a map of Kansas, not Nebraska. 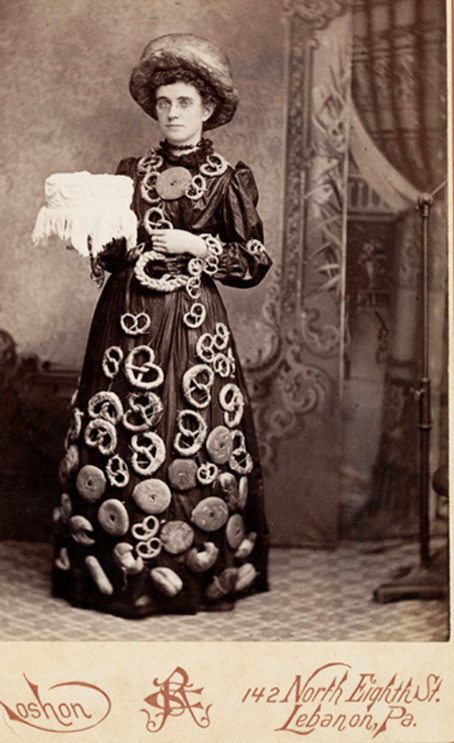 or at least the Russo-centric part of it. 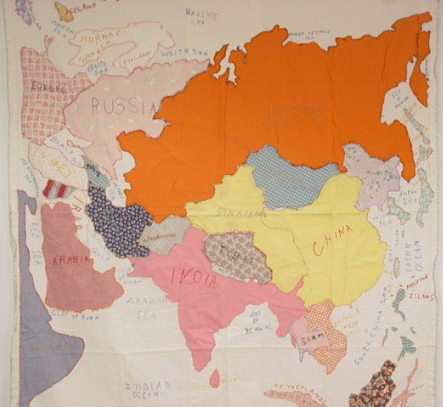 havoc with the gulf states here. 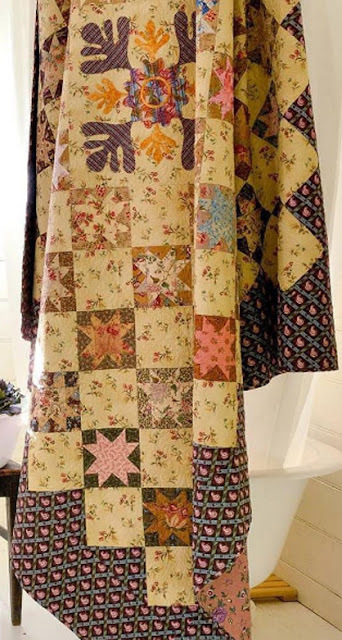 Sarah Jane's Scrapbag by Margaret Mew. 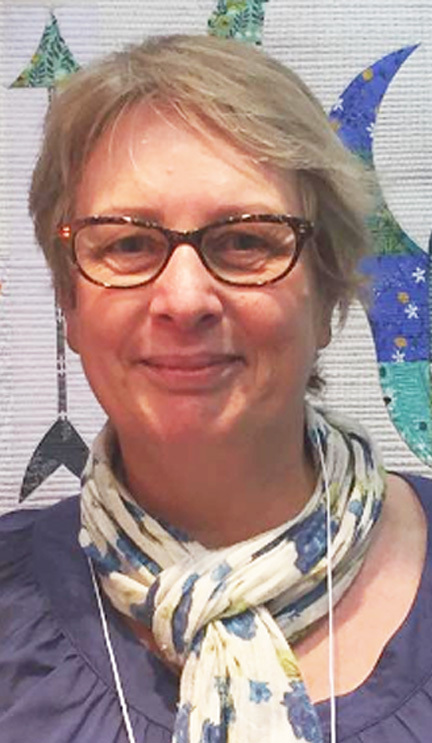 October's Past Perfect nominee is Margaret Mew from Elphinston, Victoria, Australia. 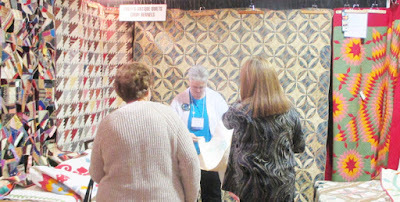 reason for her business name Quilt Station. 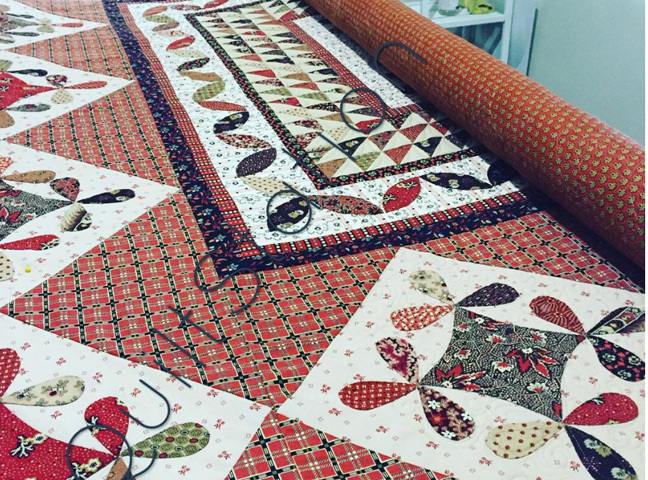 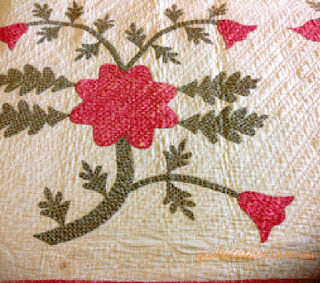 "Designing and making new quilts inspired by antique quilts, that’s what I love to do. 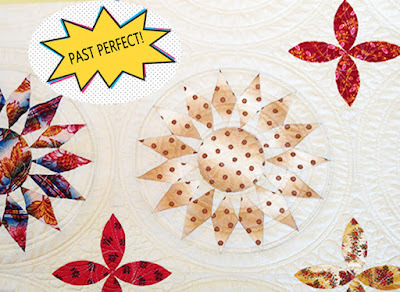 Some are fast and some are slow. 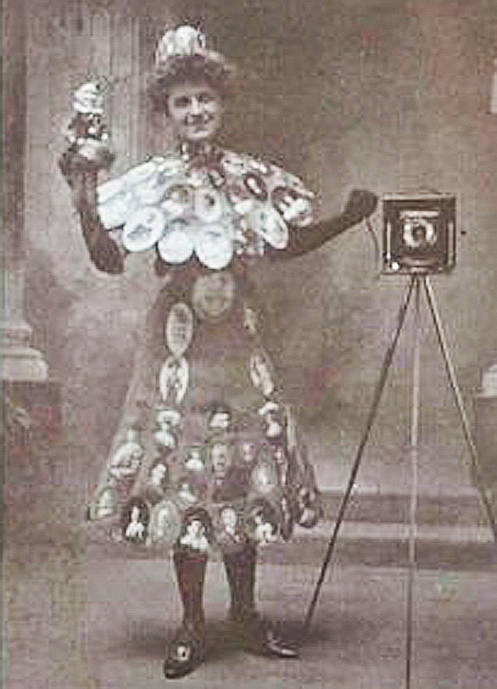 . . very, very slow. 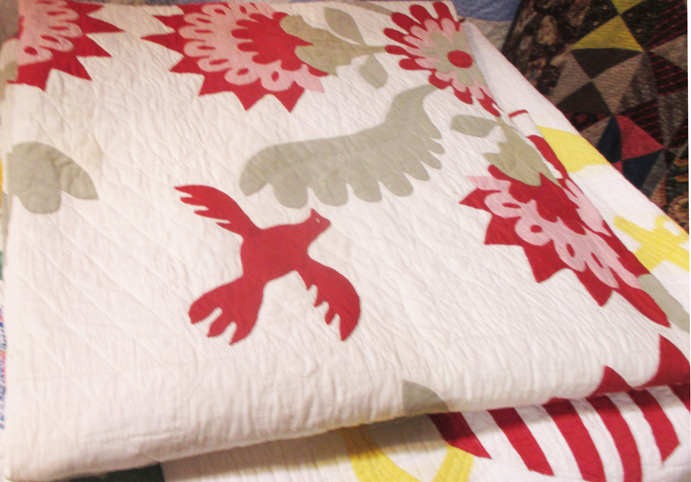 I don’t mind how long they take me to make. 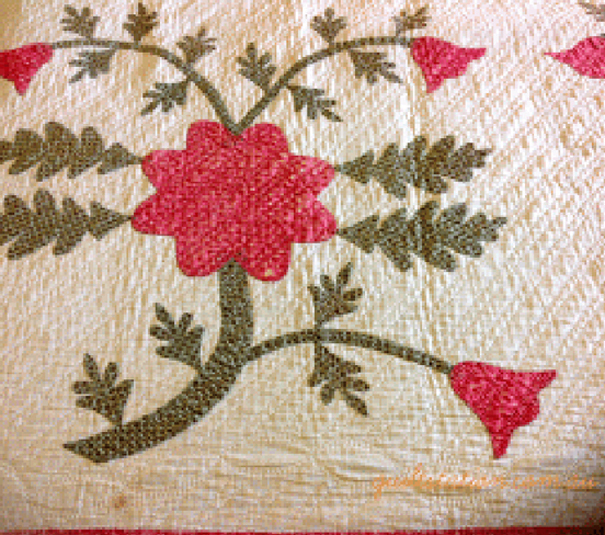 The quiet time spent planning, drawing and then stitching is my reason for starting. 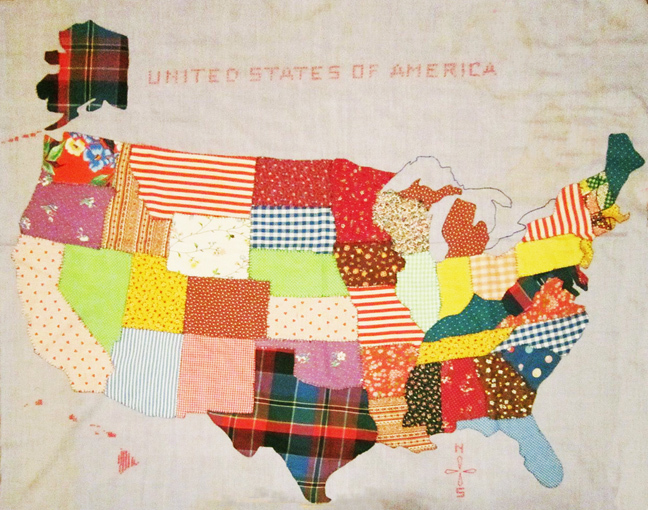 The journey is just as rewarding as the destination." 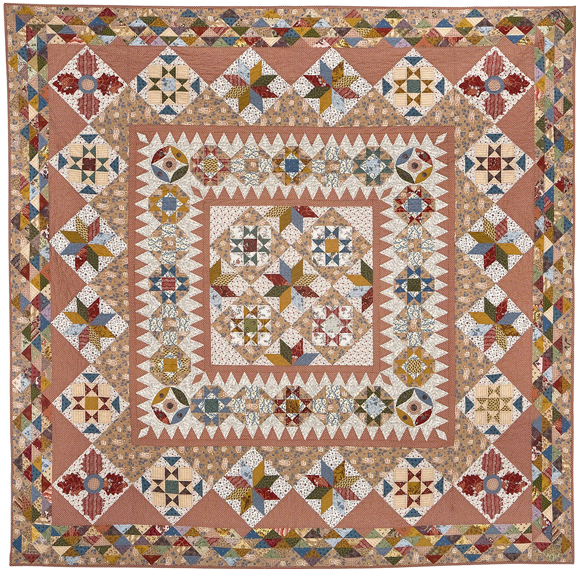 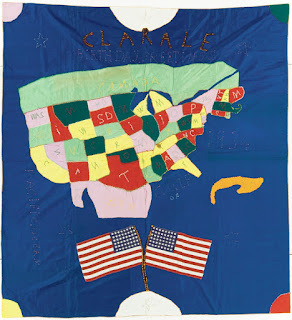 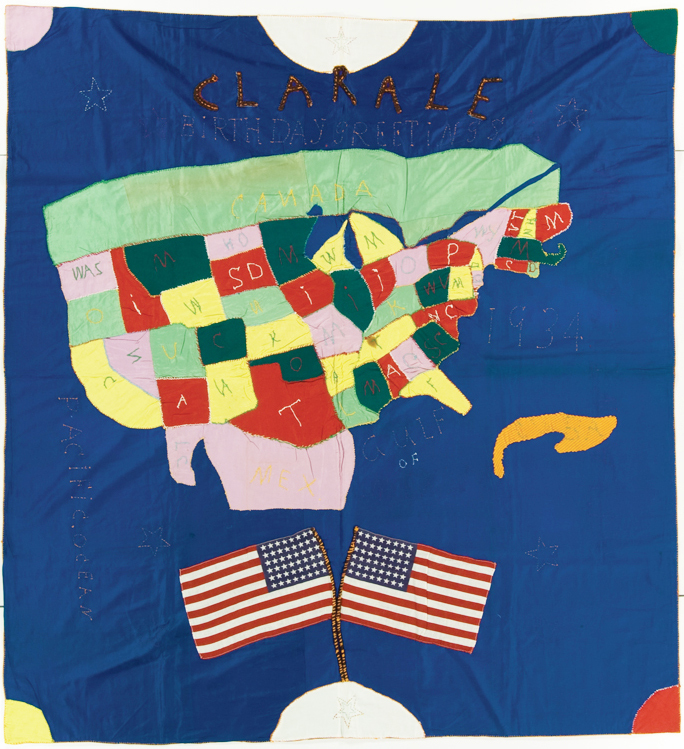 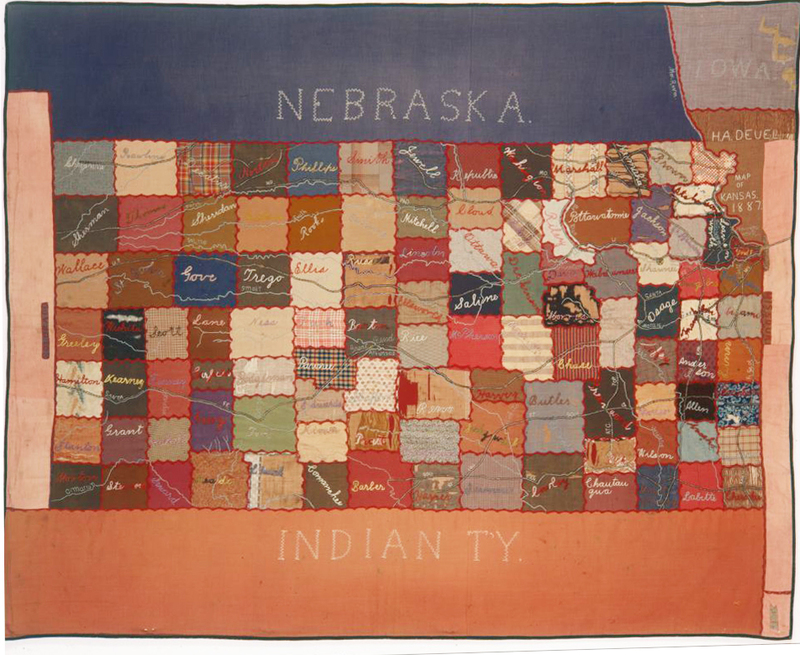 Her reproduction quilts began with inspiration from quilts from the British Isles. 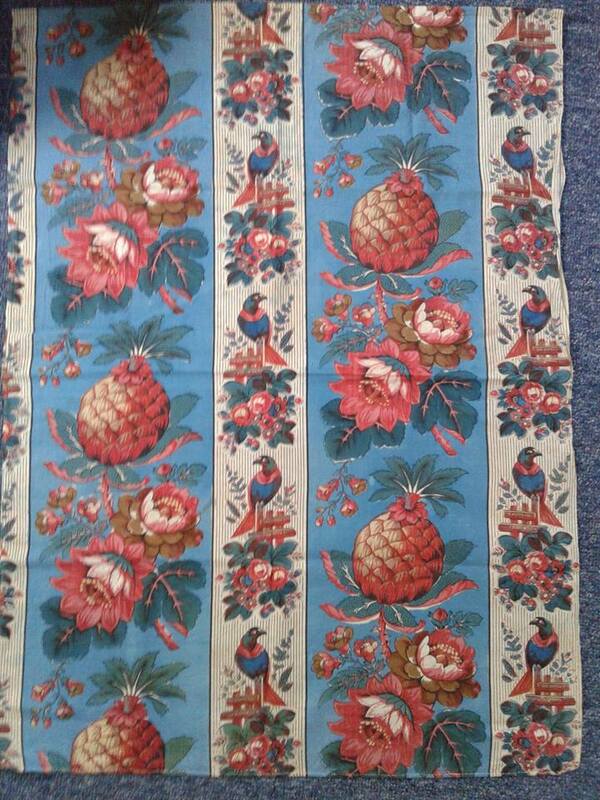 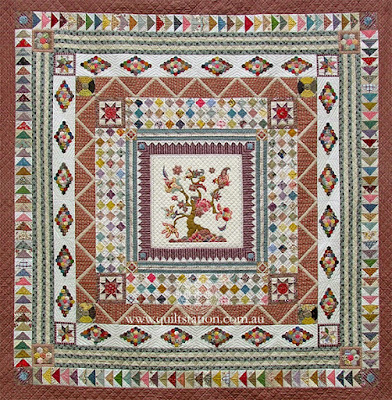 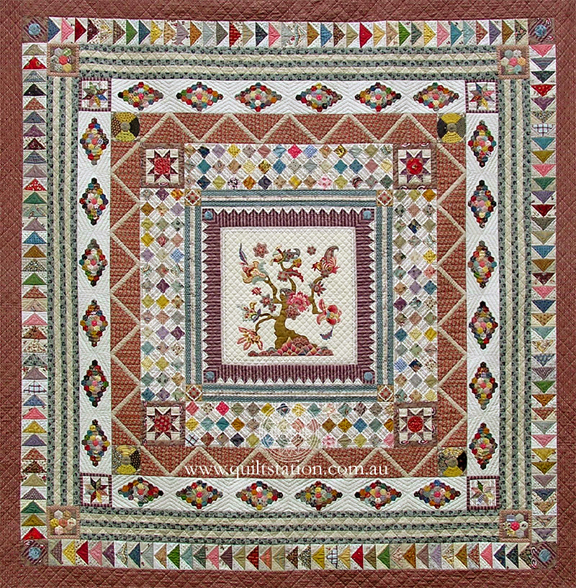 Banyan Tree was inspired by a quilt from about 1815. 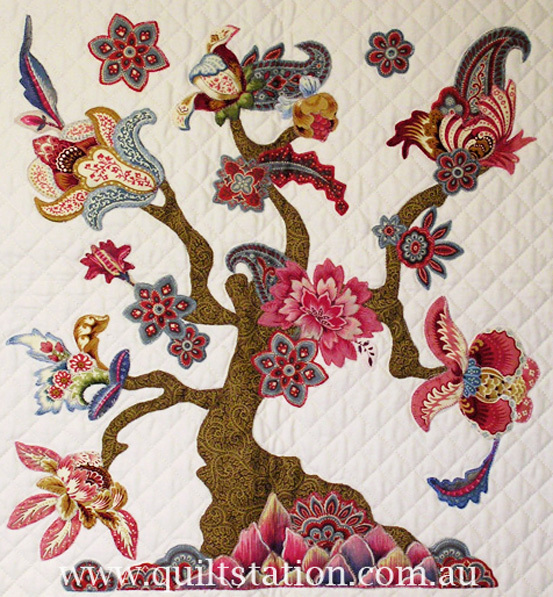 She sells templates for some of these designs. 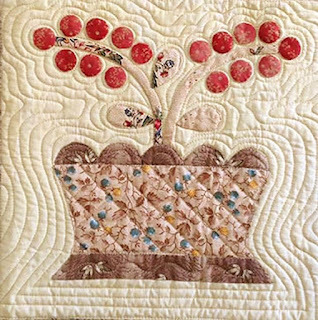 Helen Hays quilted this one. my favorite Mew talent is her use of fabrics. 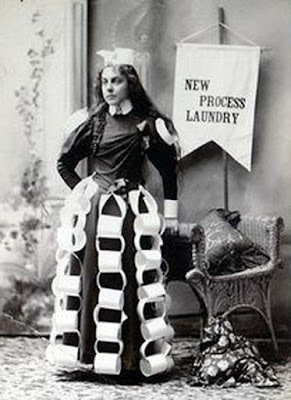 And she knows how to use it. to capture that antique feel with an update.